Farmgirl, I am always in awe at the titles you use for your photos. Your ability to think "outside the box" is fantastic, whish I could be so creative. Also wish I previewed my comments before posting them, then I would find my spelling mistakes. Ha! A dove feather? I think it's the time of year when they shed a few and try to put on more "feather fluff" for winter. Perfect shot! Your eye's in the right place at the right time, as usual. 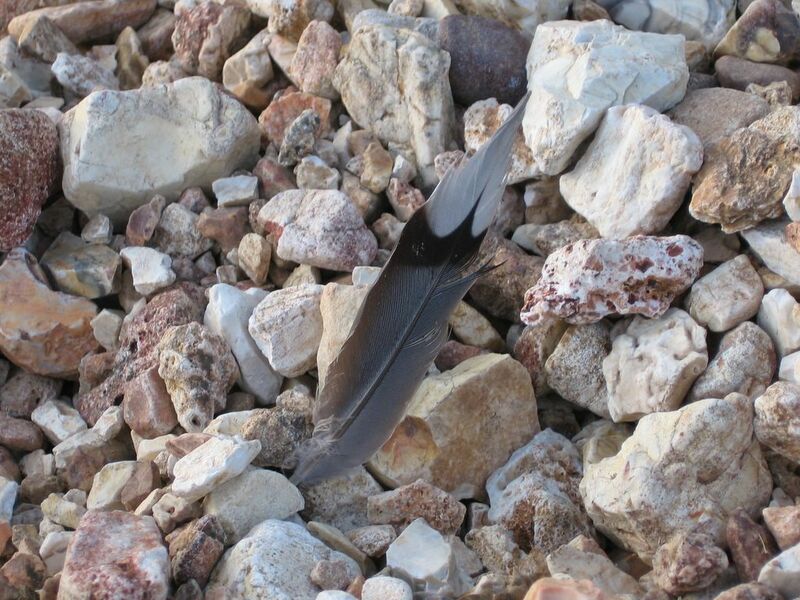 I love the rocks behind the feather...what fun texture! You know, FGS, you have a lot of interesting rocks at your place. Are those native to your property, or were they brought in for some other reason? Weekend Cat Blogging # 69 will be hosted by Sanjee at the House of the Mostly Black Cats Blog Site. Looking forward to seeing all of your cat photos and comments this weekend. WE ARE ALSO HAPPY TO HAVE OTHER FOLKS WHO MIGHT WISH TO HOST A WEEKEND. PLEASE LET US KNOW.